Russian nationalists have organized the Russian March in central Moscow during the celebration of National Unity Day on Nov. 4. Having been annually held in Moscow since 2005, the Russian March has become a commonplace for those who want to express their discontent on Russia's migration policy and other domestic problems. Previously, the authorities didn't sanction such meetings and nationalists organized them in outskirts of Moscow which brought together not many people. But this year, with the Russian society getting more experince in organizing sanctioned meetings, Moscow authorities have approved the rally of nationalists and allowed them to held the march in central Moscow. The rally has been dedicated to the 400th anniversary of the liberation of Moscow from Polish invaders. This time the nationalists have demanded imposing visa rules to citizes of Central Asian countries, abolition of the 'extremism' articles of the Criminal Code that outlaw extremist nationalism and igniting national hostility. In addition, they expressed their support for fair elections and freedom of political prisoners. For the first time the Russian March has brought together from 6,000 to 20,000 people, according to different estimates, and has been held not only in Russia, but also in other countries. While the police says that the march gathered about 6,000 participants at the begining of the event, the organizers of the rally claim that 20,000 people had joined the nationalist rally in Moscow. "Twenty thousand have joined the ranks today, a hundred thousand will take part tomorrow and then a million will join in," Alexander Belov, a leader of the "Russians" nationalistic movement, announced from the stage. "The Russian March was held on practically every continent: in the U.S. and in Canada, in Russia and in Australia." He claimed that nationalist rallies took place in more than 40 cities of Russia. The march reached the square near the Central Arts House where a rally began, an Interfax correspondent reported earlier. Activists near the stage held Russian imperial flags and their organizations' symbols. Despite its large scale it didn't result in serious incidents, according to the data from some Russian media outltets. As the Moscow authorities said "no serious irregularities have been reported." Yet human rights activist and a number of officials claim that there were abuses during the march. "Calls for violence and extremist acts are made during Russian March actions," said Moscow Human Rights Bureau Director Alexander Brod. "The reaction of police is weak. It's a shame that nationalists have privatized National Unity Day celebrated on Nov. 4." Officials from Russia's Public Chamber echoed his view. "Masks worn by some participants in the Russian March in Moscow are a pure provocation and a violation of the law regulating mass actions," said Russian Public Chamber member Maxim Grigoryev in an interview with Interfax. "The police must detain and charge the violators. The march organizers are directly responsible for such violations." He emphasized that culture of mass actions was just been developed in Russia. "Participants and organizers are learning to hold protest actions in a correct and non-aggressive form, while the police are learning to ensure security pursuant to current laws," the expert said. As Interfax reported earlier, several participants of the march set off smoke pellets in central Moscow. Police did not react and the march was continuing in a veil of smoke. Earlier, several Russian march demonstrators had fired flares at a police helicopter hovering over them. Meanwhile, some Russian cities, including Kazan and St. Peterburg, have seen more serious consequences of the rallies organized by nationalists. About 54 participants of the Russian March were detained in Kazan on Sunday, according to Interfax. The local authorities didn't authorize the rally. But a number of Kazan's public organizations gathered their supporters in the downtown of the city. They described their rally as "a people's assembly dedicated to the National Unity Day and the Day of the Our Lady of Kazan Icon." In response, the police took them into custody. 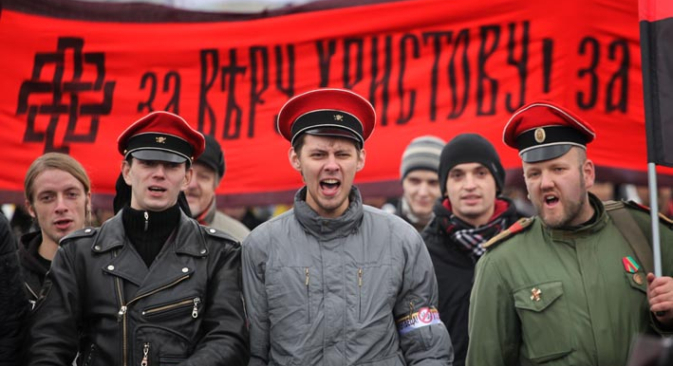 St. Petersburg police also detained participants during an unsanctioned nationalist rally. Young men with imperial flags took to the street in central St. Petersburg and started shouting "Long Live Russia." After the incident the police arrested them.